Multiple pools, restaurants, tennis, nearby golf, spa, and beach - this resort has it all. Spacious rentals have that lavish plantation feel to them. Take a second to sit back and admire the ocean. You've got a prime view of the ocean from the resort's restaurant. You're steps from an expansive beach and a short walk to Apache Pier. There are lots of pools and a water play area for the little ones. Built on the dunes, you get nothing but peaceful ocean views. Grab a drink at Beachcombers as you lounge by the pool. Royale Palms Condominiums by Hilton is located in Myrtle Beach, close enough to experience all that the area has to offer but far enough to enjoy peace & quiet. Don’t bother unpacking once you get to your condo, just get changed into swimsuits and get ready to hit the outdoor pool. Go for a swim or relax with the latest issue of People magazine and a cocktail from the poolside bar & grill. When it’s time for lunch, head to the on-site ocean view restaurant. Take advantage of the state-of-the-art fitness center and get in a quick workout. Treat yourself with a post-workout visit to the Royale Day Spa for a massage or manicure. Need an afternoon pick-me-up? Good news! The on-site coffee shop serves Starbucks – sweet! Two- and three-bedroom condos sleep six to ten guests and have enough space for the kids and all of their toys, blankets, and games. Full kitchens have everything you need to make everyone’s favorites. Recruit the kids to help bake your famous double chocolate brownies (not that they’ll need convincing). Don't worry if the kids end up with chocolate on their clothes, that's what the in-suite washer/dryer is for! Show off your multitasking skills and throw in a load of laundry while you watch TV. It has premium cable, with HBO, CNN and ESPN and a DVD player. Catch the big game, the latest episode of Game of Thrones or a movie. See what’s on HBO or play one of the DVDs that you brought from home. Once the little ones are asleep, enjoy a relaxing soak with the lavish bath amenities in your jetted tub. You will get a good night's sleep thanks to the premium bedding and blackout curtains in your condo. Up for a game of golf? Head to Arcadian Shores Golf Club for a little friendly competition. Surprise the kids with a visit to Splash Waterpark, located at nearby Kingston Plantation. Shopaholics, rejoice! Broadway at the Beach is just fifteen minutes from Royale Palms Condominiums by Hilton. Check out the variety of shops and grab a bite to eat at one of the many restaurants. 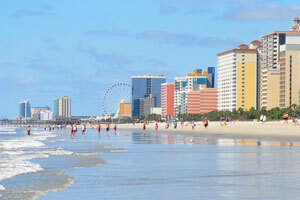 The SkyWheel provides the best views of Myrtle Beach from almost two-hundred feet in the air. Fans of Ripley’s Believe It or Not will not want to miss Ripley’s Aquarium and Ripley’s Odditorium. The aquarium features a 750,000-gallon shark tank, glass-bottomed boat rides, and a stingray experience. The Odditorium has Robert Ripley’s collection of strange and unusual artifacts including an authentic shrunken head and a six-legged pig.